I started this post three weeks ago and it’s been sitting in “DRAFT” mode waiting to be finished! It’s so unfair to keep such eye candy all to myself for so long, so today I decided to get to it and share the beauty with all of you. 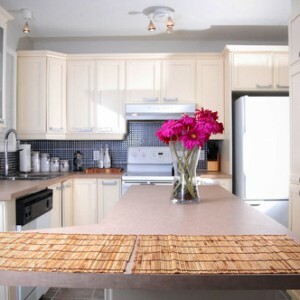 Who says floors and back splashes should have all the fun? Why not take that tile all the way up to the ceiling to create some major wow factor! And that is just what we are seeing in this renewed design trend—floor (or countertop) to ceiling of gorgeous wall tile. 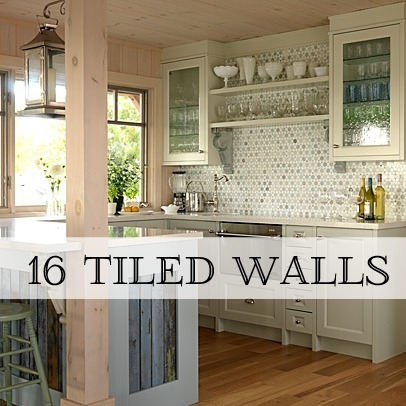 On Pinterest, I have noticed more and more kitchen and bathroom designs being pinned that include gorgeous tiled walls. These chevron tiles are so fun! Although I have to admit that after grouting our kitchen stone backsplash, I can’t say that I would look forward to doing an entire wall of grouting! Tile is also a major commitment. Unlike stripping wallpaper, tile is the extreme sport of DIY to change out. But wow, it is so beautiful! Blue subway tile anyone? Gorgeous and bold move for sure! 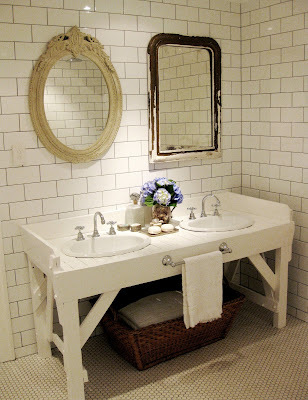 I would be more inclined to use white subway tile for a more timeless look. 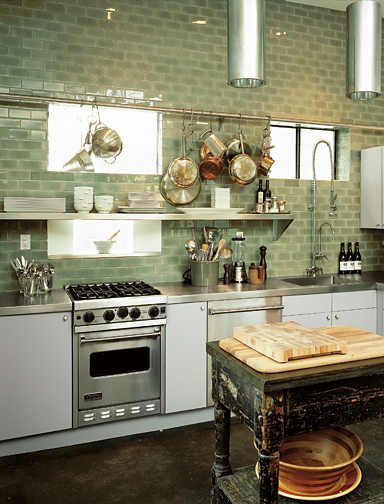 However, I have to admit that this multi-tone subway tile is stunning! The picture below is all over Pinterest right now and it is a beautiful example of this trend. These Morrocan inspired tiles are actually hand crafted cement tiles. So pretty. I’m loving the classic color combination of blue and white with the marble countertop. But kitchens aren’t the only ones being draped in tile! 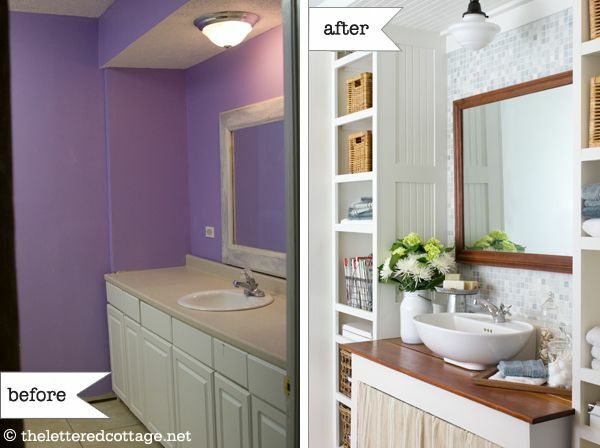 Many designers are implementing floor to ceiling tile in bathrooms beyond just the shower stall. 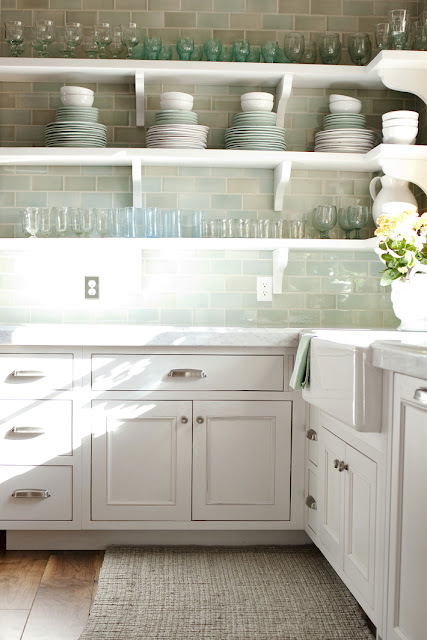 Sarah Richardson is known for her use of tile in kitchens and bathrooms! This is my favorite. I am in love with this tile. And of course Layla & Kevin recently tiled the wall space in their guest bath for a lovely focal point. And there are some designers tiling walls in living rooms and dining rooms, however, I still prefer my tile to remain in the kitchen and bathroom. Call me conservative. Okay, perhaps I’ll make an exception for around the mantel! So what do you think of this renewed trend? Those of you still dealing with mid century pink tile in your bathrooms might be more reticent to jump on board with this trend! I am currently considering tiling one wall in our half bath, but I’m admittedly nervous. Tiled walls are gorgeous but indeed require commitment. I’m not sure I’m ready to get hitched to tile yet. How about you? These tiles look awesome 🙂 🙂 But the best part is that they would help keep the kitchen clean since they are always easy to clean and what not. They grasp one day thney will re-enter the workforce full-time. Others are in-patient where you aree kept within a hospital and monitored. love these. Many of the tiles look like the marble rounds I used to face my fireplace. 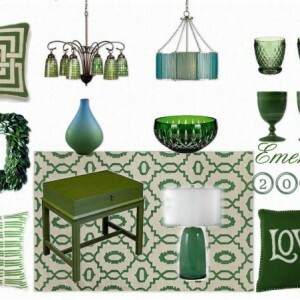 I love it….but….I might not plan well enough and later want to hang something on the wall that wouldn’t hang on tile. yikes! I can’t choose which one is more beautiful. I love them all, tile work is my fav decor advice! All of these tiled walls are GORGEOUS! 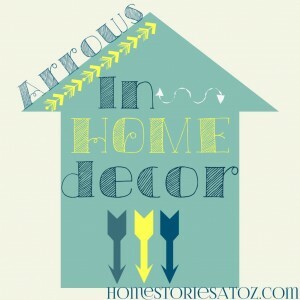 Thanks for the inspiration – good thing my soon-to-be-hubby is a contractor! Meet your newest follower! Gosh, they are gorgeous! I do love Sarahs… she really does pick out some beautiful tile! And thank you for the sweet shout out, Beth! I love using tile to make a statement. I have a couple of new clients I can’t wait to showcase the finished project. Hope to share with you soon! When I get to do my down bath I really want to do this. I have been considering it for a long time. I just love it! I really like this trend, my only problem would be that it’s expensive, but very beautiful. Thanks for sharing! Have a fabulous day! I love this trend, though there is no way I’d commit to that much tile personally. 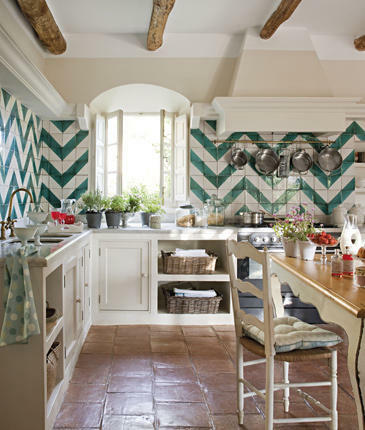 Oddly enough, I don’t care that much for the chevron trend, but I love the chevron tiled kitchen the most out of these gorgeous inspiration pics…must be my current obsession with green and yellow. Love your post on tiles and all the gorgeous pics. Last year I thought myself to do tiling, and it is so much fun (lots of work too!). Plus there are so many great choices to pick from. I love the photos, but I am a bit of a commitment phobe on this trend, I admit it. You’re right – this takes commitment to a whole new level! Wallpaper is nightmare enough – this would be serious demo to change it out. But it IS beautiful! I also agree that the commitment is scary. I do like it in kitchens and baths, but I would probably not commit to it. I did to the ceiling tile in my kitchen and I love the look!! I love these picks. I think I just about pinned every other one. 🙂 Thanks for sharing.